For emergency cooling, rent one of our self contained Packaged Air Conditioners. They come in cooling capacity sizes from 3 to 30 ton cooling capacities. Typically a ton of cooling can cool about 200 square feet of area depending on current ambient and load conditions. These units come in skidded, cart or trailer configurations. Perfect temporary rental cooling solutions for special events, temporary emergency cooling, movie studios, movie location, special events and retail applications. Power options include 208/230 volt single and 3 phase, plus 460 volt 3 phase configurations to accommodate power at most all location. 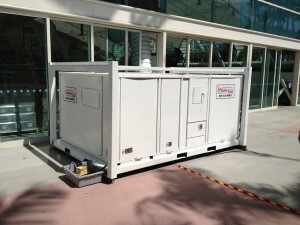 These rental temporary emergency units can be delivered and setup to operate in less than a day. These units come with a reasonable amount of flexible ducting and power cables at no extra cost. Additional accessories include remote power start and stop switch and dual setting adjustable thermostats that can control either supply or return temperature. Also available are power generators for locations that do not have adequate electrical available on site. 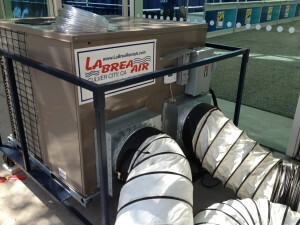 La Brea Air can arrange everything to provide heating or cooling to any space from 200 square feet to 100,000 square feet and beyond. 5 – 15 ton portable air conditioning rentals come either on a skid, trailer or roll able cart on wheels and can be easily rolled just outside the space as a portable industrial AC solution. A 5 ton portable cooling unit can cool typically up to 1,000 square feet. Power requirements are 208 volts or 230 volts, 60 cycle, in either and or (1) single phase power or three (3) phase which is normally found in commercial and industrial locations. A 50 ft power cord is included with the packaged cooling unit along with two (2) – 50 foot long flexible ducts (supply and return). When cooling is done moisture is removed (condensed) from the air. This condensate water is collected in an internal drain pan and can be connected and drained to a nearby floor sink or flower bed. Other accessories include remote thermostats and remote start/stop switch. Large 20 – 30 portable air conditioning rentals come either on a skid, trailer or roll able cart on wheels and can be easily rolled just outside the space to be conditioned. A 20 ton portable cooling unit can cool typically up to 8,000 square feet or more. Power requirements are either 208 volts, 230 volts or 460 volts, 60 cycle, in three (3) phase which is normally found in commercial and industrial locations. 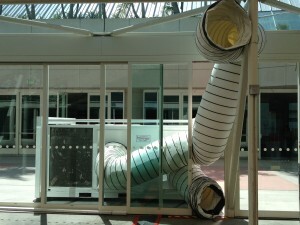 A 50 ft power cord is included with the packaged cooling unit along with two (2) – 50 foot long flexible ducts (supply and return). When cooling is done moisture is removed (condensed) from the air. This condensate water is collected in an internal drain pan and can be connected and drained to a nearby floor sink or flower bed. Other accessories include remote thermostats and remote start/stop switch.